Speed shear occurs due to a change in wind speed over a distance. Speed shear is important since it can lead to vertical motions of air. 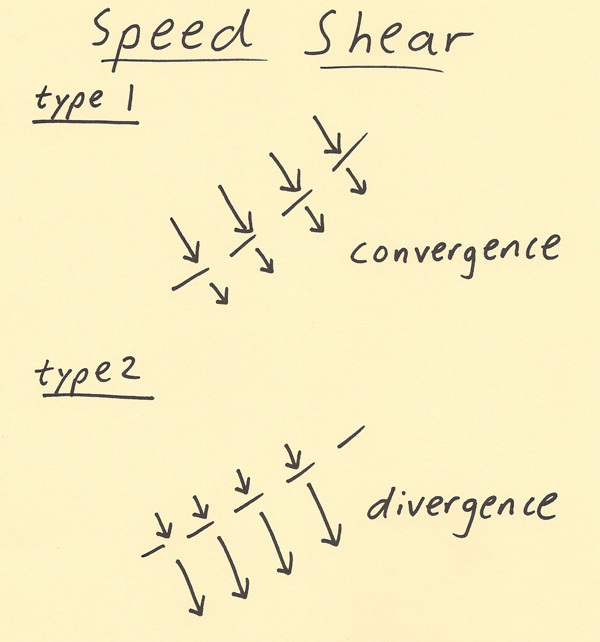 As a first example, see the type 1 speed shear in the diagram below. In this case there is strong wind moving into weaker wind. When this occurs at the surface it will lead to rising air since the piling of the air has no place to go but up. Situations this can occur is along fronts and outflow boundaries. For a second example, see the type 2 speed shear in the diagram below. In this case there is strong wind moving away from weaker wind. This can lead to sinking air if it happens at the surface since more air is leaving where the dashed line is than air that is able to replace it. If this occurs aloft, such as with jet streak divergence or divergence with vorticity advection, then it can lead to rising air. In meteorology this is sometimes called an “evacuation of mass”. In order to replace this mass that is being lost, air will need to either sink from aloft or rise from below to replace it. Generally, an evacuation of mass aloft will cause air from below to replace it (rising air) and an evacuation of mass at the surface will cause air from above to replace air (sinking air). Directional shear can either be horizontal (changing at the surface or at only one particular pressure level aloft) or vertical (changing with height). Directional shear occurs when wind directions are different as air flows toward or away from an axis boundary on a horizontal surface such as on the surface chart or on the 850-mb chart. When air streams move into each other (as shown is type 1 horizontal shear below) then the air piles together along that axis. When this happens near the Earth’s surface, it leads to rising air. When this happens aloft (from 500-mb to top of troposphere) then it will generally lead to sinking air. 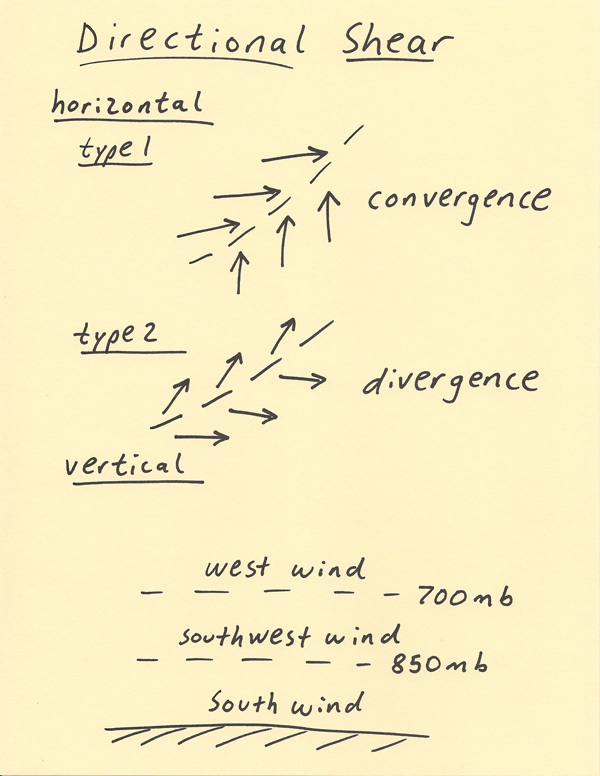 In the type 2 situation shown below, the wind vectors are moving away from each other. Generally, when this happens at the surface it will lead to sinking air and when it occurs at 500-mb or higher it leads to rising air. Another category of directional shear is vertical shear. In this case, the wind direction changes significantly with height. This shear can indicate differential advection. It can also help enhance severe thunderstorm development. When air masses change with height then typically the wind directions will be very different. On any day, the winds typically shift with height due to surface friction being most significant at the surface and decreasing with height. Weather forecasters look for a significant shift of direction with height in order to take notice of it (more shear than on a typical day).